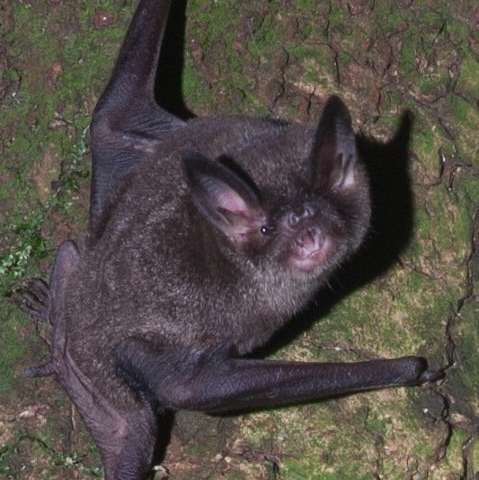 Female lesser short-tailed bats can size up a potential mate just from his singing. A new study in Springer's journal Behavioral Ecology and Sociobiology shows that the New Zealand bat species Mystacina tuberculata relies on singing as a primary method of courtship, and the complex signals given out by males allow females to assess the physiological suitability of a mate. The research was conducted by Cory Toth of the University of Auckland and Stuart Parsons of the Queensland University of Technology in Australia. Lesser short-tailed bats (Mystacina tuberculata) are one of only two bat species in which the males congregate in so-called leks to compete for the attention of females. During their breeding season, males gather at night in small tree cavities called singing roosts. Some roosts are occupied by a sole male bat, while other dwellings known as "timeshares" are the base for up to five bats. From these locations, males call out to passing females hoping to attract a mate. Singing roosts are generally spread out around the large communal roost trees that the bat population rests in during the day. Toth and Parsons recorded and analyzed the vocalization of 16 lekking male lesser short-tailed bats. In the process, they identified four distinct notes used by male bats as part of their efforts to attract a female—upsweeps, downsweeps, trills and tones. These sounds were either uttered as single notes or combined into one of 51 different distinct syllables. On average, each male produced 29 different syllables. Four distinct syllables—a combination of trills, upsweep-trills, trill-downsweeps, or upsweep-trill-downsweeps—were especially popular and were used 69 per cent of the time. Furthermore, the males studied each had their own distinct, individual way of producing each of the four most popular syllables. The males seldom fell silent during the course of the six hours they spent on average in the singing roosts. Based on the researchers' calculations, a male could produce up to a hundred thousand syllables per night. "Lesser short-tailed bats potentially have one of the highest sustained song outputs for either birds or bats that researchers know of," says Toth. The length of the second most popular syllable that male bats produce, the trill-downsweep combination, is thought to contain very specific clues about the body size of the serenading males. Larger males were found to utter significantly shorter trill-downsweeps, while those on the smaller side produce longer ones. "The length of the trill-downsweep combination provides females with the opportunity to appraise male size by auditory clues alone," explains Parsons. "Our results suggest the singing displays of male lesser short-tailed bats are signals that provide useful, honest cues of male characteristics and identity to females, and are as complex as the songs of many bird species."